Today has been a grain sack inspiration day around here! I love antique European grain sacks and they can be used for so many different things…….pillows, table runners, upholstery projects, Christmas stockings, tote bags, lamp shades, and much more that I’m probably not even thinking about. 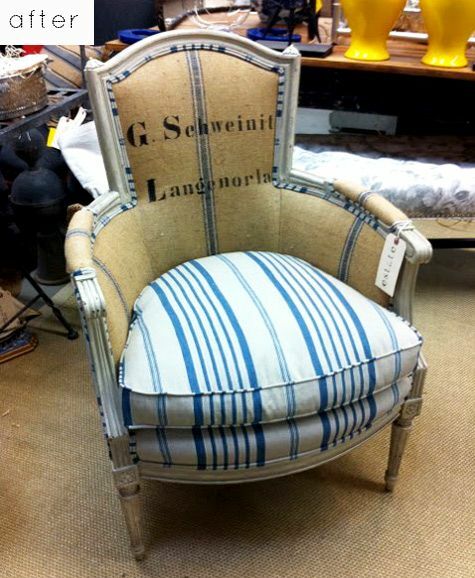 I upholstered my first set of chairs several months ago using some antique grain sacks from Europe and now I am hooked. I have renovated a French sofa in them, several more chairs, and quite a few footstools. I’ve also made several pillows out of them. I love the way the finished product looks and it gives an instant French look to the home. My favorite grain sacks are the ones from France and Germany, though if they have graphics on them they can get quite pricey. The sacks with initials monogrammed on them are also sought after and prized highly, their prices reflecting that. Hand stitched with the original owner’s initials, these sacks look beautiful when used in a way that showcases the monogram. I was recently asked if the upholstery is “itchy” but it really isn’t. Unlike burlap, most of the European grain sacks are made of a very heavy, nubby fabric and when laundered, they end up with a very soft feel. And because they are so heavy duty, they are perfect for upholstery projects. Come visit our Pinterest board for more inspirational photos! We are down to one set of antique European grain sacks in the Edith & Evelyn Vintage shop, but we’re bringing more in next week! What kind of projects could you use them on?